The easy way to get an OPC XML DA Server. No .NET Framework and no web server is required! 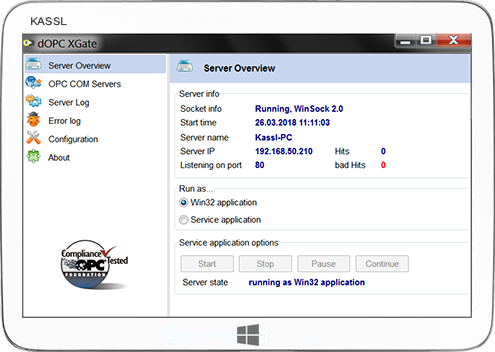 The dOPC XGate Server Gateway is based on the OPC XML DA specification 1.01 and is designed to work with existing OPC Data Access 1.x, 2.x and 3.0 servers. To get access to the OPC XML DA web service you can download our dOPC Explorer, dOPC XCOM or our dOPC Client Toolkit for Delphi, C++Builder or you can use every OPC XML DA 1.01 compliance client program. OPC XML DA Overview The OPC XML DA specification is based on Web Services and no more on COM/DCOM. Web Services are based on HTTP as transport layers as well as SOAP and XML. The OPC XML DA specification doesn't replace OPC COM, but is rather an extension of the present OPC COM DA specification. The ability to publish plant floor data across the manufacturing enterprise using the Internet by breaking through any firewall. The capability to use XML, HTTP, SOAP and Internet technology to develop OPC XML-DA clients and servers on non-Microsoft platforms (like Linux, Mac OS, Android, iOS etc.). The capability to publish plant floor data in formats that are easily used by enterprise applications such as manufacturing planning, scheduling, quality and asset management.